The word is getting out that Foundation Preparatory Charter School is exactly what parents find most important at some of New Orleans’ most prominent (and private) schools. Yes, we have a new location and the warm welcome to the City Park/Faubourg St. John Community is appreciated. 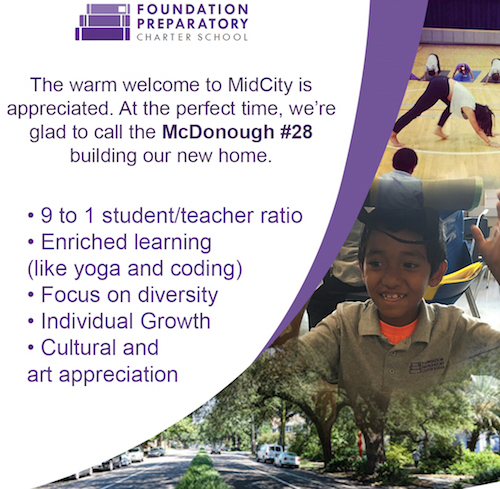 Foundation Preparatory Charter School is glad to call the McDonogh #28 building our new home. This space will allow us to serve more families who are committed to their child’s education. Visit foundationprepratory.org to learn more.